My grandsons have hundreds of Hot Wheels® vehicles. Race cars, trucks, emergency vehicles, and more. Literally hundreds filling buckets and boxes. I used to carry a new one for their collection to give them each time I arrived at their door. No more. They have plenty, I think. What they don't have, though, are roads on which to roll those nifty mini machines. 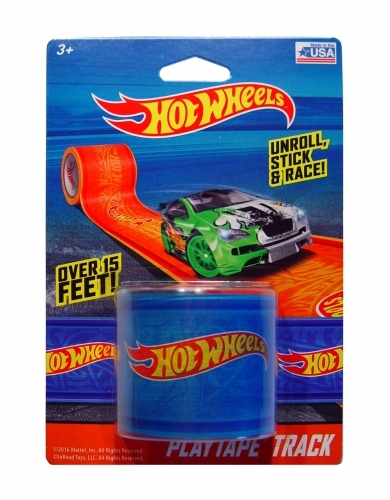 And though Hot Wheels® are plenty of fun to roll and race sans tracks, the new PlayTape® Track and accompanying PlayTape® Track Curves will be a fabulous and fun addition to their collection. InRoad Toys rolled out the nifty Hot Wheels® PlayTape® goodies just in time for stuffing in the stockings of Hot Wheels® this holiday season. The tape and curves — available in orange and blue — can adorn most any place the imagination might take the little cars and such. Bud and I had an opportunity to try out the PlayTape® Track and PlayTape® Track Curves recently. I handed over the goods to my reviewer and off he rolled... and stuck and curved and crafted an imaginative addition to Grandma's play room. Bud enjoyed his road-building so much, he decided to leave the track in place for when his cousins (Bubby, Mac, and Jak) visit later this month. I bet they'll enjoy the winding, wending work of their buddy. Plus, it's inexpensive (and great for stuffing in stockings). The PlayTape® Track runs $4.99 to $5.99 for 15 feet of track; PlayTape® Track Curves cost about $7 for a pack of 8 curves. 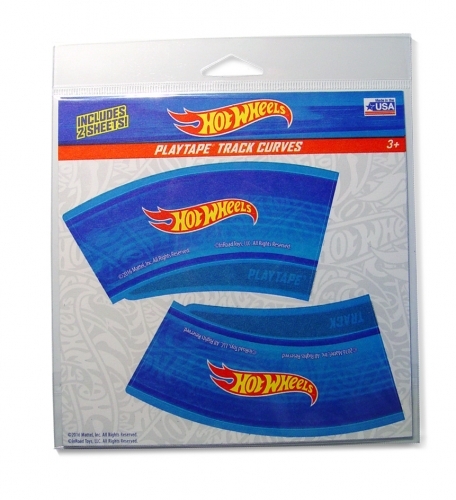 Hot Wheels® PlayTape® Track and PlayTape® Curves from InRoad Toys can be purchased at many stores that sell toys and on the InRoad Toys website. Disclosure: I received this product free for review; opinions are mine and Bud's.